Mother’s Day aka May 14th and you see all marketing gimmicks crooning about the virtues of a mother’s love – selfless, unconditional and an epitome of giving. And they make you feel incomplete if you don’t smother dear mommy with expensive gifts and goodies for the perfect payback of all her love! Put these human-stunts on hold and let’s delve into a different world of motherhood in the wild! 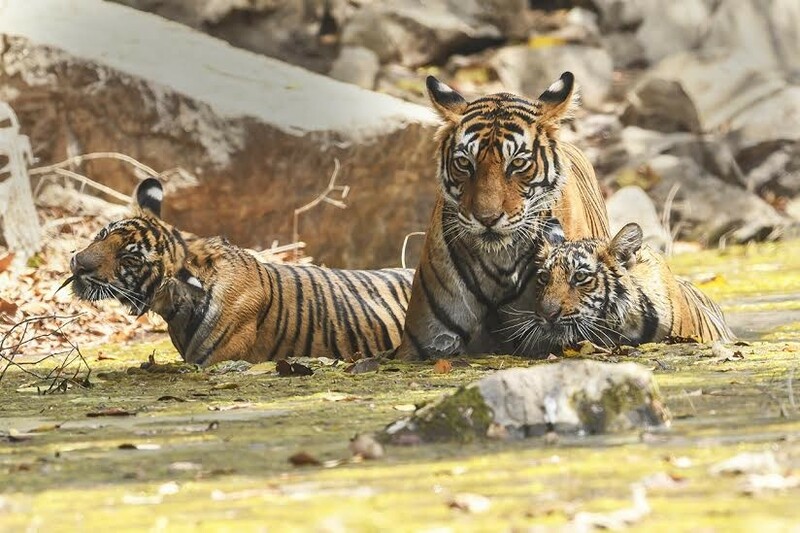 As mighty mom of Ranthambore, T-39 or Noor takes us on her journey of raising tiny tots, for the fourth time! She took the well-deserved breather from her mommy duties, as she lay resting in the cool shade of a tree. The scorching heat bore down on the family of four, and yet the tiny tots seemed oblivious to the heat, content in their own world of play and some more play! Mommy dearest was the ultimate multi-tasker, catching a day-time snooze while keeping a watchful eye on her li’l ones. They were, after all, at a dangerously frisky age when the urge to defy the norms and explore was too much. Yet, danger lurked everywhere in the wild, even for this apex predator, and this fourth-time mother knew better than to repent later on. All of 10 months old, we saw the trio daughters sometimes follow mommy to the heel, sometimes back off for a little self-adventure. Their lives were a medley of play, naps and meals. Meals brought home by their mother, a single soul capable of providing for an entire family of hungry mouths! Dashing Diva, she was, the “Noor” or apple of eyes of Ranthambore. She lazed around for a change, enjoying motherhood, proud mom to three lassie littles that she was. And the entire family basked in the bliss of her motherly commitment to her clan. Noor, Mala or Sultanpur female i.e. T-39 is a dominant tigress of Ranthambore National Park. At around eight years old, she is the “Second family” of Ranthambore, having descended from the sister of the great Machli, born to T-13. She was first spotted with her latest fourth litter of cubs sometime around November-December 2016 when the three to four-month-olds were seen frolicking about in their new forest world, very different from the safety and warmth of mommy’s womb. The litter is believed to be fathered by the dominant male, T-57. Experience and expertise came to her aid, for Noor is no ordinary female. Confident to the core, and with tons of mommy experience to back her, she is seen raising her cubs with a fierce devotion. Today, they stand at about nine to ten months, ready to explore the world actively by her side. All of about seven years, today her territory ranges far and wide in the prime of the park. hides the litter in nooks and corners while she goes out on her hunts to provide for the family. Even as the apex predators in India, tiger cubs are susceptible to many threats- leopards, sloth bears and so on. In fact, the greatest threat to cubs is from an unknown male tiger i.e. a male who is not their father. Such males tend to kill them, the reason for which is largely unknown. A mother must watch out for wandering males to keep her cubs safe. After the initial few months of fun and frolic, this mommy must get strict if her cubs are to survive. This means transitioning from mother to teacher- she must teach them the necessary hunting skills to make a kill and to sustain. Cubs often learn by observing and imitating their mothers during a hunt. A cub’s hunting skills may often be a reflection of its mother’s expertise and experience, along with its willingness to abide by her orders! It is after she dedicates around 2-2.5 years of her life, that she must let go of the family time, and coax her young ones to go out and explore their own world. Tiger sub-adults separate from their mothers around 2 years of age, with females tending to stick around a bit longer. For any striped mother, this is a time of transition, of moving on from motherhood, of bringing life full circle, of reclaiming her original territory or establishing a new one. Noor seems to have perfected the maze of motherhood perfectly, having completed the fourth quadrant in this life phase with her fourth litter! A spectacle to the eye, this family of four presents! May her legacy live long!